Idris Elba is in four major studio films this year, but you won’t see his face in any of them. Three of those high-profile jobs are voice roles: In addition to playing Chief Bogo in Zootopia and Shere Khan in The Jungle Book, Elba has a supporting part in Pixar’s upcoming Finding Dory. His only live-action role in the lot is playing the villainous Krall in Star Trek Beyond, where he’s buried under so many facial prosthetics that he’s more than unrecognizable — he’s a different color entirely. I can’t fault Disney for wanting to cast Elba in all of those cartoons: The man’s got one of the best voices in cinema, rich and insinuating. And now that Elba has become something of a sci-fi staple in films like Prometheus and Pacific Rim, perhaps it was inevitable that he’d don makeup for a franchise like Star Trek. But as one of the few black leading men in Hollywood, Elba means something. So what does it say when we see so little of him? Perhaps it’s just another symptom of Hollywood’s current failure when it comes to actors of color: If movie studios continue to treat black faces as an onscreen rarity, it’s not much of a jump for those same stars to then be deemed exotic-looking and alien. Elba and Saldana have both played extraterrestrials several times and if Nyong’o does sign on to the sci-fi thriller Intelligent Life, as has been rumored, then only one of the four films she’s shot since 12 Years a Slave will have given her a human role to play (that would be Mira Nair’s upcoming, fact-based Queen of Katwe, which required a black woman to lead it). Patton’s casting as a half-orc in Warcraft strikes me as particularly pernicious: Only in Hollywood would someone think that the beautiful Patton’s mixed-race features could contain a dollop of monstrousness. And yet, when these are the only big roles available, who can blame these actors for taking them? When black actors want to play human beings or lead a film themselves, they’re continually forced to work outside the major studio system or in independent film. Aside from Saldana’s recurring role as Uhura in the Star Trek films — a part that has traditionally always gone to a black actress — the last time she was able to appear in her own skin in a big-budget studio film was 2011’s Colombiana. Elba’s talent has been apparent for ages, but outside of his negligible cameos in Marvel movies, he’s spent the last three years since Pacific Rim working almost exclusively in independent movies or smaller films for specialty distributors. I’m encouraged that Elba was just cast as the lead in The Dark Tower — a part not written for a black man — and I hope this can be the bulwark that lets him resemble himself onscreen from now on. Look at Will Smith, who minted his movie stardom 20 years ago after a string of lead roles that made use of his charisma, talent, and winning face. Why is Smith, whose unobscured face will be on display in this summer’s Suicide Squad, treated by Hollywood as a rare fluke, rather than as an example of what can happen for this new vanguard of dramatic black talent if we provide the right opportunities for them? In the wake of this past year’s second straight #oscarssowhite debacle, I saw people like Spike Lee calling on Hollywood to adopt some version of the NFL’s Rooney Rule, which requires teams to interview minority candidates for the league’s top jobs. Whether or not that’s realistic, it’s not unreasonable to expect studios that use black actors’ prodigious talent in their animated films to pony up live-action roles for those thespians, too. 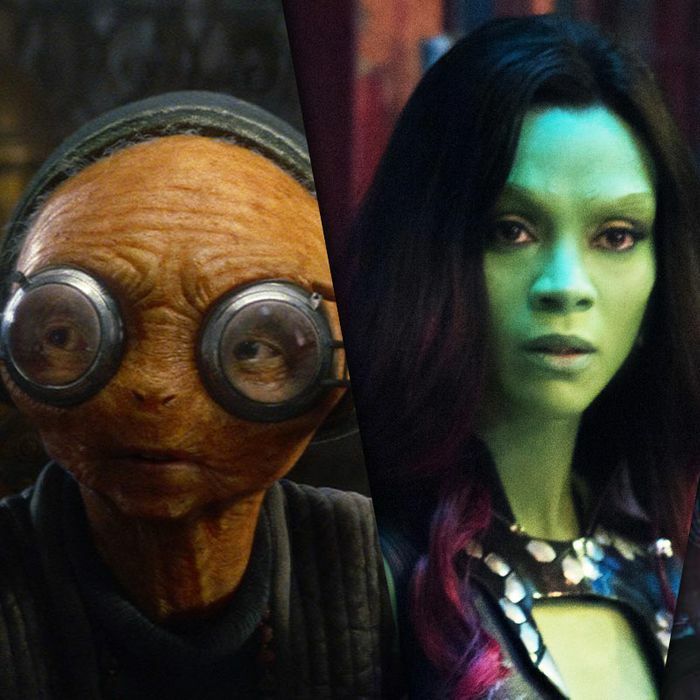 And if they’re not going to paint Margot Robbie purple, maybe they should stop doing it to Zoe Saldana. The black actors I named in this article are some of Hollywood’s most talented and beautiful, and they deserve to be seen for countless reasons, not least because in this screwed-up world, representation must continually be fought for. Idris, Lupita, Paula, and Zoe have faces that matter. Let us see them. Why Won’t Hollywood Let Us See Our Black Actors?